The central character in Magic is a magician named Charles “Corky” Withers. When he was still at high school Corky got injured in a football game and ended up being stuck in a hospital bed for quite some time. Hospitals can be boring places and when he asked a nurse if she could find something for him to do she brought Corky the hospital’s game box. It contained a deck of cards, a lotto board and some dice. She also brought him a book of card tricks and that is when Corky first became interested in magic. Being interested in becoming a magician is one thing; actually pulling it off is something else entirely. Magic is a tough game to get into and even after Corky has spent several years being trained by a top magician, Hymie Merlin, he still does not have the confidence to take that first step onto the stage. When Merlin dies though, Corky is forced into action. If he wants to continue living at Merlin’s apartment he needs to find a way to make enough money to pay the rent so he bites the bullet and signs up for amateur night at the Stardust nightclub. Corky is a fantastic magician and his onstage performance reflects this fact, but it’s a tough crowd at the Stardust and they remain unmoved by even the most spectacular of tricks. After such a miserable debut, and faced with imminent eviction from his home, Corky returns to Merlin’s apartment and has a breakdown that culminates in him switching on the gas and lying down to die. And that’s when Fats comes on the scene. At first Fats is only a voice in Corky’s head that tells him to turn off the gas, but Corky’s alter-ego is soon housed in a wooden ventriloquist dummy and having the smart-mouthed Fats onstage with him changes everything. They make a great team and the future is bright. Problems arise though, when Corky’s manager, Ben Greene, gets him the chance of ‘a pilot special’ with CBS. CBS insist that Corky undergo a medical examination before offering him the contract. Jeopardising his entire future, Corky refuses to be examined. Ben finds this strange and when he begins to have doubts about Corky, and wants to talk to him about the problem, Corky decides to run away, and where better to run to than his home town and the only girl that he ever loved, Peggy Anne Snow. Magic is a very good book, but it does not follow a strict linear timeline and the first chapter is particularly unusual because it is written from the perspective of Fats, and it paints a worrying picture of Corky’s state of mind. In fact the first 50 pages of the book suggest that he might have some very serious issues indeed and may even have killed some people. The next 60 pages of the book are written in flashback and give the reader an insight into Corky’s early life and the events that led up to him getting his big break. The remainder of the book is set in the Catskills, where Corky rents a lakeside holiday cabin from Peggy Anne Snow. It is off-season and Peggy’s husband is away on business, so the only people at Lake Melody are Peggy, Corky and Fats, who, it has to be said, does his best to oil the wheels of love for Corky and Peggy. At first anyway. As soon as things begin to get serious between them Fats becomes jealous and shows a much darker side to his nature. Fats and Corky are of course one and the same, but the character of Fats is so strong that it is easy to forget that fact and right up to the last page of the book it is impossible to predict which one of them will prove to be the dominant personality. One of the most powerful parts of the book is when Corky’s Manager turns up at Lake Melody and witnesses Corky having a fight with Fats. Corky insists that he was just rehearsing an act, but the old man is not buying it and wants to get him some help. Threatened with exposure, Corky does not know what to do. “Stop him,” Fats urges. “How?” Corky asks. “With what?” “MEE-MEE-MEE-MEE-MEE—” Fats screams back at him. Ventriloquists Dummies have hard wooden heads, so that particular tête-à-tête should have been fatal, but Ben is a tough old guy and killing him proves to be harder than expected. In the end though, Corky manages to silence his manager forever and Ben becomes a permanent resident of Lake Melody. 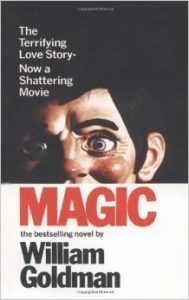 Magic was first published in 1976. It was and instant hit. 1976 was also the year that the film Marathon Man was released (based on Goldman’s novel of the same name) so it could be argued that the success of Marathon Man may have helped influence the sales of Magic. The story is so gripping though that I have no doubt whatsoever that Magic would have still succeeded in enthralling its readers. Magic was also released as a film, in 1978. Anthony Hopkins was cast as Corky and, as I have seen the film several times, I was worried that I may be too familiar with the story to fully enjoy the book. I need not have worried. I thoroughly enjoyed the book, it’s a great read, and even though it was written over 30 years ago I did not find it at all dated and it is easy to see why film version of Magic was so quick to follow the book. Some stories just work and this one works so well it’s like magic.